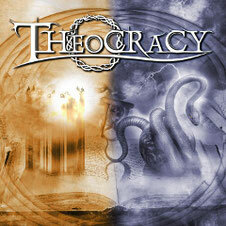 The long out-of-print debut album with a melodic metal band THEOCRACY is finally re-issued and available again. It was originally released in 2003 on MetalAges Records, and has been out of print for several years. The debut album received many fantastic reviews, and was also acclaimed worldwide, so fans have constantly asked for a re-issue. Theocracy drummer Shawn Benson re-recorded drums on all tracks for the re-issue, Matt Smith (THEOCRACY, SOULSPELL) re-mixed completely and it was mastered by Mika Jussila (Nightwish, Stratovarius, Children of Bodom). The re-issue album features liner notes and track comments by Matt Smith (see a video below), and will be released through Ulterium Records on November 15th in Europe and November 19th in North America. On the album, a multi player Matt Smith takes in lead vocal, choir vocals, rhythm guitar, lead guitar, acoustic guitar, bass guitars, keys and orchestration, Shawn Benson is on drums. Also engineered, produced and mixed by Matt Smith and the artwork by Mattias Norén (Kamelot, Circus Maximus, Evergrey). We hope you will enjoy the album which achieved a higher level of maturity. THEOCRACY will have a headliner show at the 3rd annual micro festival CALL FOR ETERNITY vol. 3 with SIGNUM REGIS, NONA, RIGHTDOOR and SLEEPING ROMANCE at the Collosseum in Kosice (Slovakia) on November 11th 2013.